Tools That Help Us Work Better, Not Faster – Sanspoint. I’m not really going crazy about the latest shiny gadget, or cool app that redefines how we “do email.” I don’t care about what product Google is launching that they’ll kill off in another year or two. I especially don’t care what rumored “new product category” Apple’s planning to enter in 2014. None of these affect me. None of these are going to be important in six months, or even six days. It’s just more noise. What excites me are people that are making really awesome tools that help people do work better—not just more work, but better work. Too many tools are about either offloading the work we do to something else, or about letting us just do more in less time. Few tools are out there with the intention of helping us do our jobs better. Of course, “better” is a hard thing to quantify, and it’s harder to sell. Tell someone “our app will get your day’s work done in six hours instead of eight” and they’ll be interested. Tell someone “our app makes your work better” often comes off like selling snake oil. Wow. So many things to customize! And many of the products on the market, especially around creative work, are really just snake oil. Merlin hit the nail on the head with his spoof of “minimalist text editors”. 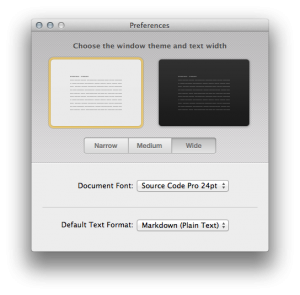 One can be just as productive in Word as they can in vi, as long as they know how to use the tool. Stripping away features can help some of us spend less time tinkering and more time working. Adding secondary features that are mere window dressing designed to give the illusion of productivity, not so much. Faster can be a part of better, but faster should not be the goal on its own. To put it another way: “Fast, good, cheap. Pick two.” “Cheap,” in this case, doesn’t just refer to monetary cost, but also to time. If it’s more important that something be done quickly, taking the time to incorporate a new tool into your workflow may not be the best option. Instead, stick with the thing you know—as long as the output is good enough. The best tools are extensions of the self. They get out of the way and their tool-ness is subsumed by the use to which they’re being applied. Think of a hammer. A good hammer is one that feels like an extension of your arm, fits comfortably in your hand, and vanishes into your sense of self as you strike the nail. So, too, should any other good tool. It’s the same thing with a good piece of software. A good tool shapes us as much as we shape it. It’s hard to switch from something we’ve used for a long time because of that. I think of the tools I use that have become extensions of myself: nvALT, LaunchBar, Launch Center Pro, Drafts, OmniFocus, 1Password, TextExpander and much more that I’m sure I’m forgetting. Still, not a day goes by when I don’t use at least one of those applications at least once. They help me work better—sometimes by shaving time off repetitive things I do, but also by giving me better ways to work. They reduce my cognitive load, giving me the ability to work better. There’s people out there making tools to reduce the cognitive load of things we do every day, especially at work. They’re using the shiny gadgets and services that all the technology journalists flog to actually improve our lives. That’s the thing that really gets me excited. It should excite you too. An iPad Air is neat, and a high-speed omnipresent Internet connection is fun, but all that power is wasted on mere web browsing and book reading. The real transformative stuff is happening in the tools it can become for us. There’s lots of money in it for the people who can do it right.